Today’s #VeteranOfTheDay is Army Veteran James Stewart Cooper. James served during the Vietnam War. After graduating high school, James felt an obligation to enlist in the military; however, every branch rejected him due to prior legal troubles. Undeterred, James instead volunteered for the draft and was called into service with the Army in 1968. James attended basic training at Fort Benning, Georgia and advanced infantry training at Fort Gordon, Georgia. After completing his advanced infantry training, James applied for and was accepted to jump school and qualified for the Airborne Infantry at Fort Benning. James then volunteered for sergeant training in response to an Army request for volunteers. Still hoping to go further, James applied and was accepted for ranger training. Although he did not pass ranger school, James gained valuable skills which assisted him during his deployment. After his training, James was deployed to Vietnam with the 173rd Airborne Brigade and was flown into Long Binh. There he was assigned to Delta Company, 3rd Battalion and ordered to replace a platoon in the Central Highlands which had been overrun by a devastating enemy attack. While deployed, James and Delta Company served as a reactionary force for the region, coordinating assaults with other platoons and performing sweeps of the area for enemy activity. After serving 11 months in Vietnam, James returned to the United States and was discharged in January 1970 at the rank of sergeant. James then spent some time traveling the country before becoming a welder and starting a family. Thank you for your service, James! 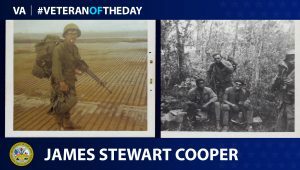 The post #VeteranOfTheDay Army Veteran James Stewart Cooper appeared first on VAntage Point.